Tracey Stewart is the editor-in-chief of the website Moomah, which provides parents and kids with ways to contribute to nonprofits. 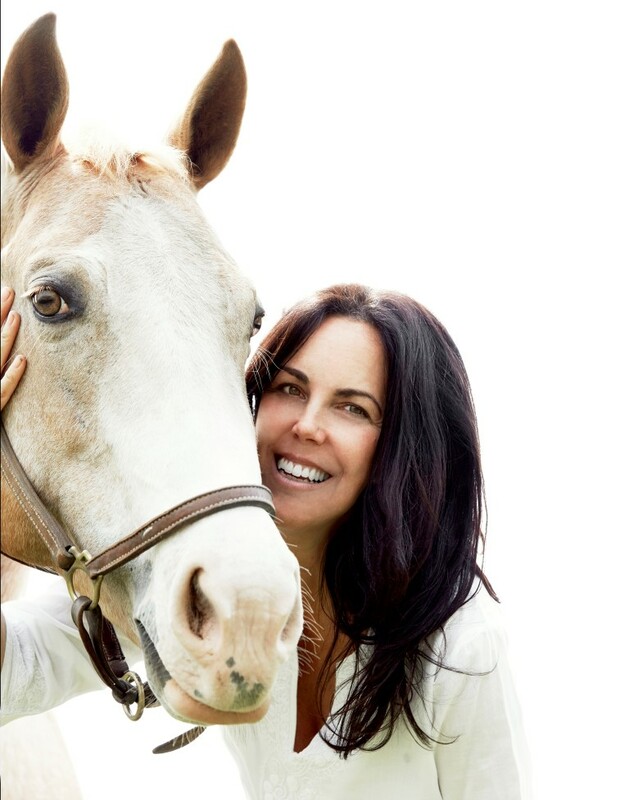 A passionate animal advocate and expert (she's a former veterinary technician), she lives on a farm in New Jersey with her husband, Jon Stewart, two kids, four dogs, two pigs, one hamster, two fish, three rabbits, two guinea pigs and one parrot--all rescues except for the kids. 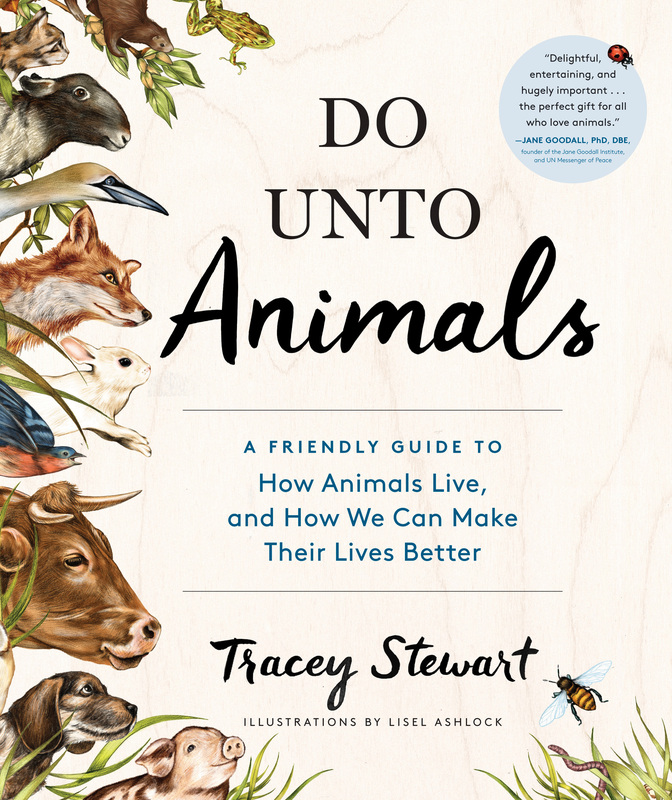 Do Unto Animals, her first book, focuses on changing how we value and interact with animals. See our review below. The story about Miss Eyebrows--the downed cow that the veterinarian offered to turn into hamburger--which instead recovered and gave birth to a healthy calf within days, was compelling. Your reflection on this experience includes the following: "I was hooked on cows and on the beauty of the relationship between animals and humans, and this was by far my next happiest day." How can we shift people's perspective from viewing animals as a commodity to creatures whose lives have value apart from our own needs? Everyone has those transformative moments. For some it's discovering Crossfit, for others it's finding religion. For me, it was cows. Coming face to face with a cow that needed my help busted open my heart. I truly believe the easiest and most pleasurable way to shift people's perspectives on animals is to provide as many people with as many interactions with these animals as possible. Most people are compassionate and don't want to inflict pain and suffering on animals. People are also busy and hungry and distracted, so they end up compartmentalizing certain animals as food rather than as sentient creatures. But when you meet animals, you have the opportunity to see them as individuals. You begin Do Unto Animals with dogs and cats--the companion animals we treasure the most. However, you eventually consider many members of the animal kingdom--from bats and earthworms to birds and bees--and explain their vital function in the ecosystem. How can parents teach the next generation to value even the least appealing creatures? Well, we all can't be pretty. Some us have to be scaly or slimy. Some of us even have to eat poo. The next generation is already born with curiosity and tenderness about other living creatures. As adults, we inadvertently lessen that sense of wonder. We get caught up in the day to day. The more we, as adults, talk about and experience the marvelous creatures around us and celebrate what they give us and what we can give them, the more we keep that innate gift alive in our children. You write, "If we start thinking about farm animals as sentient creatures, we may have to change the way we live. Human nature usually rails against this.... I will ask you to be brave and keep reading, not because you'll learn things you don't want to know, but because you might fall in love--and we all know that falling in love can sometimes be a lot scarier." How did you decide on your approach in this section, knowing that humans objectify animals and ignore the cruelty and death that preceded their Saturday morning bacon? I believe that, deep down, most people don't prefer to objectify animals even when the end result of their actions does just that. I think most people's motivation comes from self-preservation of habits, culture, health and avoidance of sadness and guilt. Once you really let these animals into your heart, though, you can begin to see that choosing to eat and shop differently brings not deprivation but abundance. For me, choosing to eat according to my values certainly required a period of transition, and it required some investigating, but in the end the payoff of feeling better emotionally and physically was all well worth it. I'm fortunate to be surrounded by people who--even though they may be at a different point in that journey--are still very supportive and respectful of my choices. Rather than providing off-putting details about CAFOs [concentrated animal feeding operations] or puppy mills, you emphasize the distinct personalities and language of animals, which makes your book wonderfully appropriate for all ages. Did you have a target audience in mind while writing this? I very much did have a target audience in mind, but it wasn't an age group or specific demographic. My goal was to cast a net large enough to catch as many reasonable, curious and compassionate people as I could. Throughout Do Unto Animals, you describe Stewart family traditions, including making a donation to the Farm Sanctuary's Adopt a Farm Animal Program for every Thanksgiving guest. How did you decide to start this? Has any of your guests ever resisted? At my family's Thanksgiving table, there are still many people I love dearly who eat animals. 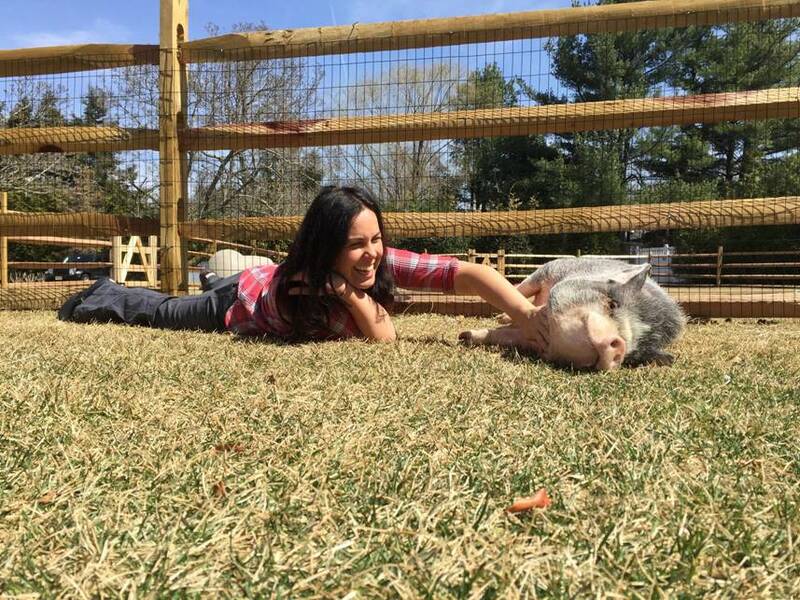 There isn't one guest, though, who doesn't delight in the adoption of their new friend from Farm Sanctuary. My cousin even cries when she sees her new buddy. The family table is where a lot of our most important and interesting conversations happen. You don't want your own personal beliefs to keep you from being at that table. Am I saddened by the turkey carcass on the table? Absolutely! To me good food, good company and good conversation make for the perfect holiday celebration. I'm not so sure where the turkey fits into all that. If I'm going to inspire change, though, I believe I have to be at that table. I subscribe to the school of catching more flies with honey. You describe your marriage as "mixed": your husband ate meat and you did not. How did you approach the eating of animals with your children? Do you have any advice for other families in the same situation?